Hopefully you all know that I am in the business of helping people rid themselves of neck pain, back pain, and headaches. In fact, most of my new patients all have some form of back pain. While this may be only ONE of many symptoms they are experiencing, it is often the driving force that brought them into my office. “I thought this was about Moms?”. Let me explain. Since we usually see mother’s first in our clinic, I wanted to write this article to help them while they were not in my office. The good news is that this applies to all HUMANS (almost)! Let me start out by giving my disclaimer. All neck pain, back pain, and headaches are unique to the individual who walks into my office and THEIR STRUCTURE. No one is perfect, and no one has the same structure, therefore it really does take a consultation and examination to determine the exact path to improving your spine health. Now lets get to the tip to decrease your low back pain. 1.) Stretch Your Psoas. Here is a great photo showing you where the Psoas muscle “lives”. Below are a few stretches to help bring down your pain levels. I think now is a good time to add another disclaimer. YOUR PROBLEM IS NOT FIXED. I repeat, YOUR PROBLEM IS NOT FIXED. Without going into great detail, I want to make sure you know why I made the above statement in bold. 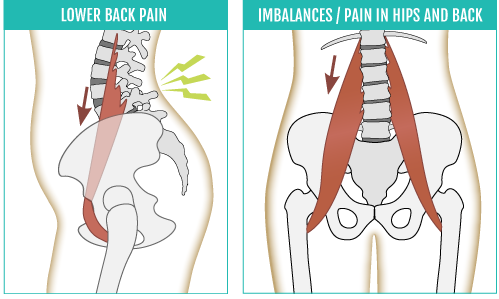 Your tight Psoas muscle is not the problem, but rather the RESULT of many things. It is the result of poor neurological control, poor posture, and lack of supporting musculature. While I hope you get some relief from these stretches, I do not want you to ignore the fact that you may have some structural abnormalities that need to be addressed. Please seek a professional that focuses on structural correction, and NO, it does not have to be me. Here are two stretches that you must put into your repertoire. I hope you seriously consider adding these two stretches into your routine. And as always, if you have something that you would like to discuss with me in person, please schedule a complimentary consultation by either calling 425-636-0303 or by filling out this form.